As an honest critic, I must begin this review by urging you not to read what follows, but simply to buy a copy of New Poets of Native Nations and read it instead. You don’t need my opinion; you need this book. It’s a perfect anthology, a masterful gathering of talent, tuned beautifully to its own concerns and those of its readers. 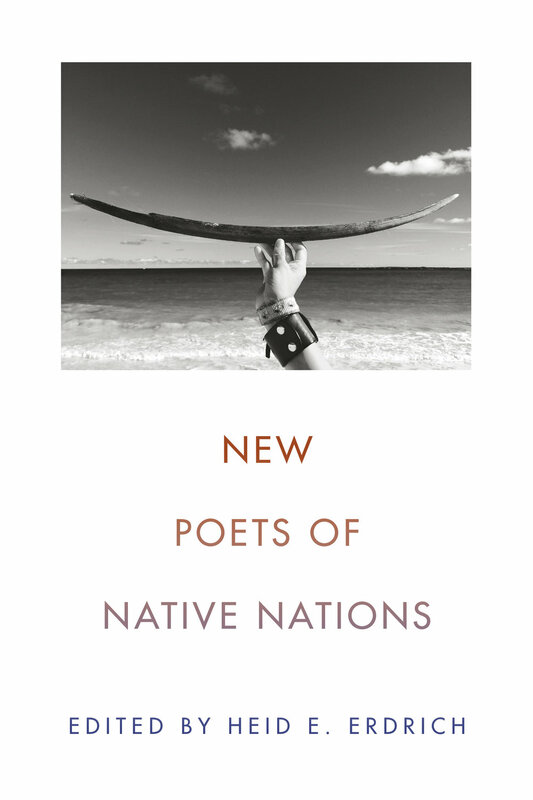 New Poets of Native Nations, ed. Heid E. Erdrich. Graywolf Press, July 2018. 304 pp. But if I must, I shall. The premise of this anthology is to bring together selections of work by Native American poets whose first books were published after the year 2000. In her detailed, persuasive introduction, editor Heid E. Erdrich notes that the last “comprehensive anthology of Indigenous American poetry” was published in 1988. Think how much has happened in publishing, in poetry, in Native culture, since 1988. This anthology fills a need, both in academia (it’s perfect for syllabi) and in the literary landscape, but as Erdrich points out, it’s frustrating that the writers in this collection need to be anthologized before they are read. Native writing should not be reduced to a single representative writer, or even to an anthology like this one. However, this book is an ideal place to start correcting this long oversight. In fact, one of the collection’s purposes is to instruct the reader in how to find more of what it offers. The authors’ notes at the end of the book include suggestions about other Native poets who ought to be better known. Many of these suggestions are self-referential (Layli Long Soldier suggests reading dg nanouk okpik, while dg nanouk okpik suggests reading Layli Long Soldier) or repetitive (multiple poets were mentored by Joy Harjo, whose generosity seems boundless), but they still provide enough material for months of reading. Plus, each poet’s biographical note, placed before their selection of poetry, indicates the books they have published, along with, usually, their tribal affiliations. Some poets are quite new (Tacey M. Atsitty’s first book was published in 2018), but others have extensive experience (Cedar Sigo has published eight books). The poetry itself varies beautifully. Each new section holds surprises, new perspectives, and lessons that may be old to the poets but are likely new to non-Native readers. Whiting Award winner Tommy Pico documents his slippage between various identities with fresh language and txt-type abbreviations. Margaret Noodin’s selections are bilingual, Anishinaabemowin and English, and in their simplicity, they feel ancient and incontrovertible. Natalie Diaz, among the virtuosic capabilities she demonstrates in her allotted pages, blends Whitmanian rhythms with an abiding interest in place, nature, and the agonies of love and loss. I carry a river. It is who I am: ‘Aha Makav. There is so much more: Brandy Nālani McDougall’s saltwater-soaked elegies of Hawaii, Julian Talamantez Brolaski’s skewering “What Do They Know of Suffering, Who Eat of Pineapples Yearround,” LeAnne Howe’s “dance / to a duck’s tune” and her eerie evocation of Mary Todd Lincoln conversing with a “savage Indian” in 1875. I would mention every poet in this collection if I could. Each brings a unique set of aesthetic and/or political concerns to this project. In so doing, they demonstrate the enormous breadth and depth of contemporary Native poetry, which has been hiding in plain sight all along. What all these poets have in common is an abiding interest in their own identity, as well as a sense of grappling with the past and the land while maintaining a self in the difficult present. Above, I called this a perfect anthology. By that I mean that it’s exactly the right length, price, and scope. It’s not a honking Norton tome with too many authors ever to be enjoyed, and it doesn’t gather so many disparate voices that it becomes intellectually difficult to manage. It’s attractively designed, and each poet within has a suitable number of pages devoted to him/her/them in order to get a sense of their work. And the selections are so damn good. Erdrich is a skilled and sensitive curator. However good we are, we can’t change the beginning or the middle—we can only try to rewrite the end. The writers in New Poets of Native Nations are rewriting the Native story—not yesterday’s, but today’s—one searing line at a time. Bear witness.